For well over a year now, I’ve been asking myself the same question: why is nobody talking about Yemen? Why should they be? you might ask. Well, let’s take a look. In its’ fledgling days, Yemen was a leader. A country who’s history dates back as far as the 8th century, Yemen was renowned across the globe for its’ sophisticated architecture, engineering and irrigation systems. Until the '60s, the nation was governed by a monarchy in the North and the colony-rich British in the south. Power struggles in both regions tore the country apart until everyone downed weapons, kissed and (sort of but not really) made up in 1990. It was at an opportune (read: catastrophic) juncture in 2011, rife with rising unemployment, civil unrest and general malaise towards long-time leader Ali Abdullah Saleh and his entourage that the winds of change swept across Yemen in the form of the Arab Spring. Drawing inspiration from their Egyptian neighbours across the Gulf, Yemen’s pro-democracy activists threw caution to the wind and took to the streets of Sana’a to tell Saleh & Co. that once and for all, their time was up. After 33 years of corruption, repression and shady dealings, Yemen had had enough. But much like any good monopolising dictator, Saleh was having none of it. By November 2011, Saleh had been ousted and forced to hand over power to his second in command (ouch), Abdrabbuh Mansour Hadi (try saying that backwards). But the political transition to Hadi’s administration didn’t quite go to plan, and Mr. Saleh was not giving up that easily; unemployment soared, food insecurity intensified and suicide bombings racked the capital. Disenfranchised, dissatisfied groups of dissidents sparked separatist movements in both North and South, and the situation rapidly deteriorated into a bitter battle of Us vs. Them. Confused? I don’t blame you. Me too. In the red corner, we have former President Saleh and his loyal band of Houthis - a rebel movement fighting for Yemen’s Shia Muslim minority. All fine, except wait – between 2006 and 2011, the Houthis actually fought a consecutive series of bloody rebellions against Saleh and his government, resulting in six civil wars in six years. 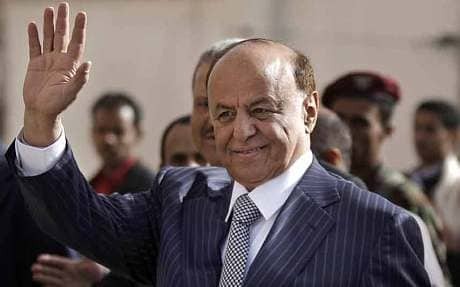 In a bizarre twist worthy of Hollyoaks, and one that nobody saw coming, Saleh entered into a backroom military alliance with the Houthis despite having waged bitter war on one another for the best part of a decade. In the blue corner, it’s former Vice Pres/Current Sort-Of Pres Hadi and his security forces (who are Sunni Muslim), a bunch of lads thrust into power via a 2012 election principally organised by neighbouring Saudi Arabia and (you guessed it) the United States. They just can’t help but meddle in the Middle East, can they? Things started to go from bad to worse in March 2015, when Saudi Arabia began spearheading operations against Saleh and the Houthis (aka approving airstrikes across the length and breadth of Yemen and razing the country’s infrastructure to the ground). The UAE has also conducted strikes on Yemeni soil, with varying degrees of support from Bahrain, Egypt, Jordan, Kuwait, Morocco, Sudan and Qatar. The supposed leaders of the free world, the U.S. and U.K., have provided logistical support, intelligence and armaments to Saudi’s grand coalition (because would it even be a war in the Middle East if America didn’t have its’ hands dirty somehow). In fact, in recent years, under both the Obama administration and *shudder* President Trump, the U.S. has sold more weapons to Saudi Arabia than to any other country in the world. Theirs is the love affair that has lasted, to be fair; successive U.S. governments have been militarily supporting (read: selling guns, tanks and bombs to) the Saudis since the good old days of World War II. These powerhouse nations might argue that all’s fair in love and war, but I doubt a single resident of Yemen would agree with them. Let’s dig a little deeper. Since March of 2015, the U.S. has authorised $22 billion *mic drop* of arms transactions with Saudi Arabia. The vast assortment of weapons sold by the US of A to the Saudis include cluster bombs and F15 fight jets – the same cluster bombs that have been explicitly outlawed by the majority of the world’s governments. And it doesn’t stop there kids. The U.S. is not only supplying physical armaments to shadowy characters in the Saudi administration: as of late November 2016, America had run 1,600 mid-air refuelling missions to coalition aircrafts in the skies above Yemen – that’s an average of two every day. These aircrafts are the same ones razing cities to the ground with drone strikes and decimating whole families. In late 2016, 140 civilians were killed in a single drone strike on a funeral procession in a suburb of Sana’a. Hang on. Nobody wants bad neighbours, but surely Saudi Arabia should be helping the war weary people of Yemen rather than destroying their entire nation, right? Wrong, and that’s because what’s happening in Yemen today is actually a proxy war between Saudi Arabia and Iran, the bitter arch-rivals of the Middle East. Dictionary corner: Proxy war is basically a conflict between two sides where neither physically attacks the other, they just use a middle man instead – the middle man in this case is embattled old Yemen. 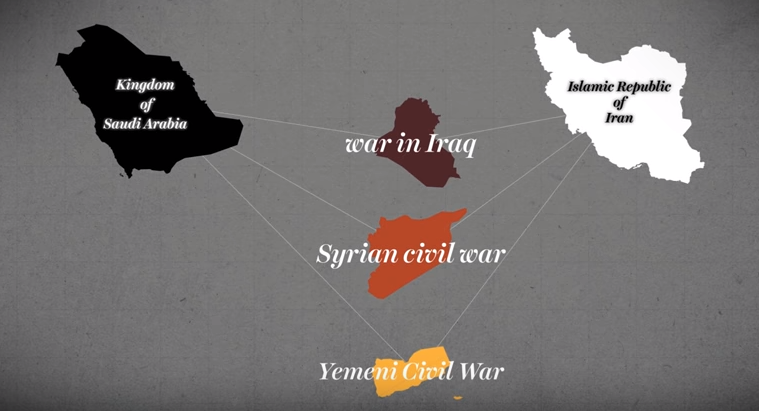 SA and Iran have been nemeses pretty much since time immemorial, but they have never gone to war against one another – they’ve fought through intermediaries again and again. First it was Iraq, then Syria, and now, it’s Yemen. 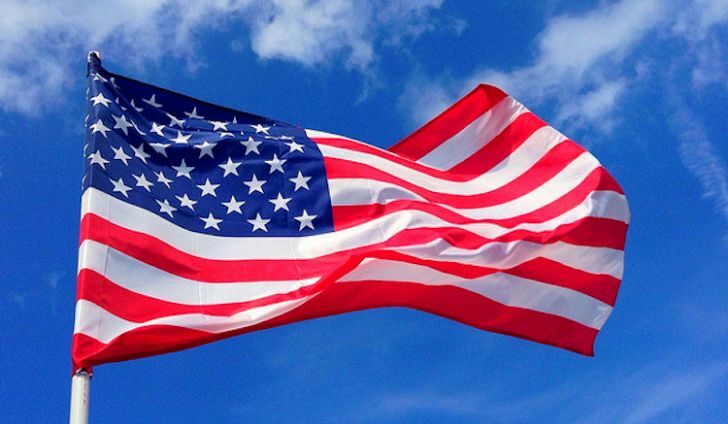 The proxy warfare going back and forth between these two nations is essentially a struggle for power, influence and ultimately regional supremacy (but that’s a story for a different day). To compound what is quite possibly the most vicious civil war in modern history, al Qaeda fighters in the Arabian Peninsula and IS affiliates have taken advantage of the utter chaos and stepped up terror attacks in cities nationwide. Earlier this week, the U.S. authorised counter-terror strikes on two IS training camps in Yemen’s Al Bayda Governorate, an ungoverned, desert area which the organisation has taken advantage of for training and transit purposes. Restrictions on food and fuel imports are taking a catastrophic toll on the civilian population of Yemen – with 80% of its food supplies imported, the country is in the grip of worsening famine, and an outbreak of cholera that began in October 2016 is just not going away. There have been over 612,000 confirmed cases in less than a year, and both UNICEF and the World Health Organisation have declared that this is a direct consequence of the heavy conflict since the beginning of coalition airstrikes in 2015. Médécins sans Frontiéres was forced to evacuate its’ teams from Yemen because of Saudi airstrikes targeting hospitals. Sanitation is next to non-existent, and there is little done about sewerage or rubbish in any part of the country, particularly in Houthi governed territories. Over two thirds of Yemenis do not have access to clean drinking water, rendering the cholera outbreak impossible to contain. According to the World Health Organisation, it is the single worst epidemic of the disease ever recorded. The International Red Cross has labelled it a man-made human health disaster which could have easily been prevented. What’s happening in Yemen right now is the world’s largest humanitarian crisis – a crisis that practically no one is talking about. UN estimates place the death toll at roughly 10,000 as a direct result of the violence that has engulfed the country since 2011. 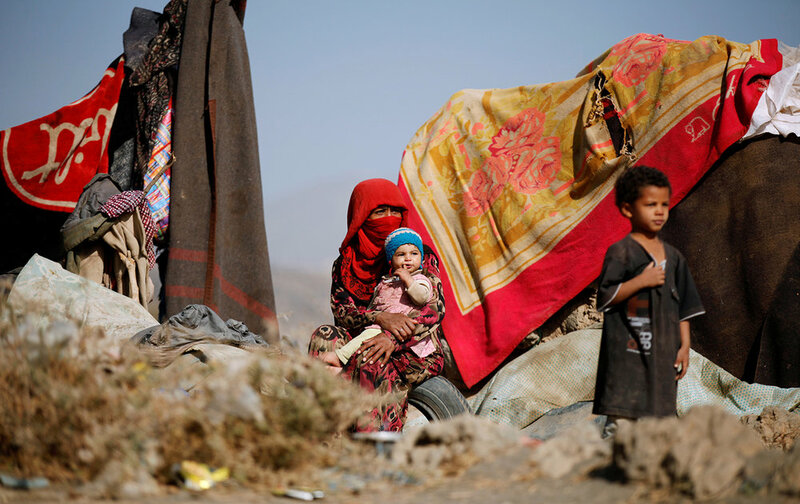 More than 3 million Yemenis have been internally displaced. In 2015 alone, 101 schools and hospitals were pummelled by airstrikes. Marketplaces, vital shipping ports, childcare and health facilities – the bombing is indiscriminate and the bloodshed is beyond comprehension. As of summer 2017, less than half the country’s hospitals were operational. Many areas of Yemen, particularly in the capital Sana’a, are designated ECO UNESCO world heritage sites. This honour is exclusively reserved for historical structures or natural phenomena of great significance and benefit to the world; since the beginning of the war, many of Yemen’s UNESCO heritage sites have been razed to the ground beyond all recognition. In the first week of March this year, more bombs were dropped on Yemen than the total figure for the entirety of 2016. By the end of March 2017, the UN reported that 17 million people in Yemen were at emergency or crisis levels of food insecurity. Oxfam estimate that 82% of Yemenis are in need of humanitarian assistance. Every ten minutes, one Yemeni child loses their life due to severe malnutrition. Last month, the director of al Thawrah hospital reported that a missile had fallen on the central residential district of Taiz. The casualties included children. The United Nations have declared that they need $2.1 billion to begin rebuilding, rehoming and rehabilitating the people of Yemen. As of July 2017, less than 33% of this figure had been raised, and the nation trundles on, locked in a strangling stalemate in which neither side will accept the other’s legitimacy. The lust and greed for power and influence from multiple parties the world over has entangled the innocent men, women and children of Yemen in a web of destruction and a pointless war which they have paid for with their homes and their lives. I wish I had all the answers, even just one would be enough, but all I can do is guide you to suggested aid organisations in the hope that at least some of our donations will make a difference to ordinary, decent people like you or I on the ground in Yemen. Take a minute to appreciate the privilege we enjoy every day, and spare a thought for the people of Yemen. I promise it will make your daily stresses seem a little less significant.